Some weeks ago, I mentioned that I'd be reviewing a set of cookware that I received from CSN.com. Well, now is the time! 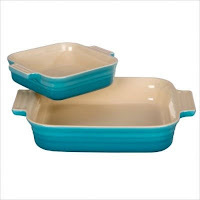 I will be reviewing the Magefesa Classic Danubio Cookware set and the Le Creuset 9" and 5" baking dishes. I had a few future classmates over to my parents' house for an authentic Indian dinner last weekend. My mom and I used the opportunity to test out the new Danubio set. It's a non-stick set (take note if you have serious worries about that! ), and it is very easy to hold and maneuver. The handles stick out quite a ways from the main dish, but they still get pretty hot when you're cooking. But they are easy to grip and thus make it a lot easier to flip the dish or turn it around. The dish also heats up very quickly. I was caught off guard by that and somewhat burned my soybeans and spinach! But it all came out well in the end. The only slight complaint I have about this set is that the blue on the handles does not match perfectly with the blue of the dishes. The handles are a lighter blue than the dish itself. This set (a frying pan, a saucepan, a casserole pot and a stew pot) is just the right size for me to take with me to school in a month. I think for the most part, it will be enough for me to cook what I need for my brother and I. I am taking an extra few dishes, but that's just to be on the safe side. Overall, I think the Danubio set would be great for someone working in a small kitchen with a limited amount of time. As for the Le Creuset baking dishes- well, I just got those because I heart Le Creuset and want everything they make. The 5" dish is very small. I think we'll probably use it for dips and such more than for any real baking or cooking of any sort. The 9" one, though, is a great size for making enchiladas or lasagna or anything else that I would want to make for just a couple of people. I also do like the light blue, even if I would have preferred the yellow. All in all, a great set of cookery to take with me to school! Highly recommend them both, if you're in the market. I think the dishes in Caribbean blue look wonderful! Well, I did just come back from a vacation in Key West, so I might be a tad bit biased! :) Happy cooking!! Nowadays, non-stick coating on pots and pans is not Teflon. It is a slightly safer coating that is more resistant to flaking and heat changes. Just wash these new dishes with caution, and at the first hint of a scratch or a flake, call your county's hazardous materials disposal to get rid of it. *gets off public health soapbox Great review! I have always loved Le Creuset, and have wanted to own a piece of their cookware for ages, so I am really excited that you got this opportunity! It's great that you got a set of pots and pans that you can take with you to college as well, and that they are the perfect size for you! This seems like it worked out perfectly all the way around!! I also heart Le Creuset! I only have one tiny pan, the least expensive item of theirs, probably, and it is too small to be very useful, but I love it anyway! Le Creuset is so beautiful! I have one of their pots that I got at the outlet mall, on a deep discount. Someday I'd love to have more. I love the Caribbean blue too (mine are all cobalt). And I have awarded you a Versatile Blogger award! If you have time stop by my blog and take a look. I heart Le Creuset too! I know nothing about Le Creuset but those dishes are gorgeous! I'd love something like those for my kitchen. Ooh, I love Le Creuset! My mother recently won one of their baking dishes in Kiwi (I believe; it was some shade of green), and she's had excellent results with it so far. I'd love to get some of their stuff when I'm back in Canada. 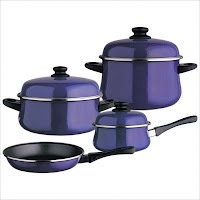 The cookware looks awesome, especially the teal color set.